When it comes to feeding dogs, it’s hard to look past the smiling, sweet personality of a Golden Retriever. Therefore, feeding them too many treats is easily done! However, there are a few basic guidelines to follow when feeding dogs. Many dogs can “free-feed”, while others can not. Free feeding means that you can keep a bowl of dog food out at all times and allow your dog to eat whenever she feels like doing so. Several of my Goldens can do this and never put on extra weight. However, a few of my other Goldens seem to live at the food bowl and would happily triple their weight! In “dog world”, the alpha is the boss and ruler of the pack. And alpha always eats first. It’s her right and privilege to do so. If you own a few dogs and one of them seems to always be hanging around the food bowl, she may simply be trying to show the other dogs that she is the boss, and therefore, ruler of the food! In cases like that, you’ll need to adjust the way you feed your dogs, and not allow your Golden to free-feed. Prevention is always the best rule of thumb in not allowing your Golden to become overweight in the first place. When feeding dogs, there are certain people foods and medications you will want to keep your Goldens away from. These items can be very dangerous, and sometimes even fatal, if ingested in certain amounts. Depending upon the individual canine, the amounts can be very small and still be dangerous. 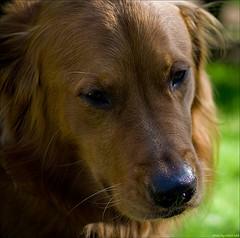 Milk is not a good choice to give to your Golden Retriever, as this can also upset their stomachs. 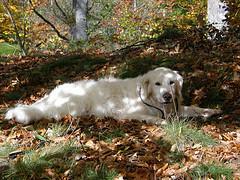 Dry food is best for your Golden, and will be beneficial in keeping her teeth clean. Switching dog food brands will cause an upset stomach and can give her diarrhea, if it is not done correctly. After correctly making the switch, it is perfectly okay to mix dog kibble brands together, for feeding your Golden Retriever, as long as that is always done routinely. I do not have a particular brand or type that I find to be best. Instead, I find that my Goldens are at their healthiest by always feeding my dogs a variety of dry dog foods mixed together. I buy 4 different varieties, dump them into a large, plastic garbage can, and mix them all together. This then becomes their basic staple for feeding. I like to blend dog foods that have chicken, lamb, beef, rice, etc., all into one meal. Since I have never found one particular brand or type of dog food that I feel is fantastic for Goldens health, this is my version of making my own! I do always use the same 4 types that I like, and always mix the same amounts by simply buying the same size bags all the time, and making the mix when the can is empty. A part of feeding dogs should also include some table scraps! Dogs need and love meat, so I allow my Goldens table scraps, unless weight is an issue. I don’t give them meat with bones still in it, due to the risk of the bones splintering and causing internal injuries. Meat, whether it is raw or cooked, is a healthy snack for them. I realize that some people believe that dogs shouldn’t be fed raw meat. However, if you’ve ever had one of your dogs come home with some “road kill” that they’ve found, then you’ll quickly realize that their digestive systems are greatly different than ours! As long as table scraps do not become the majority of their diet, and cause them to stop eating their regular food, go ahead and toss them part of that burger or steak! Do remember, that even though Goldens are gentle in nature, any dog can and will fight over a “prized” possession, and a piece of steak is definitely a prize in your dog’s eyes! If you own more than one Golden Retriever, you may want to try feeding them these special treats, in separate rooms! Some other special treats that Goldens love are homemade dog treats! These dog feeding guidelines only apply to adult dogs. When it comes to feeding puppies, their needs are different. 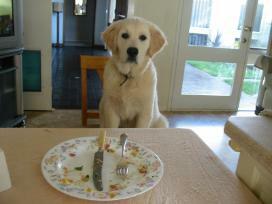 Golden Retriever’s are not picky eaters, so feeding dogs is a simple, enjoyable task!